Zika virus (ZIKV) infection during pregnancy has emerged as a global public health problem because of its ability to cause severe congenital disease. Here, we developed six mouse monoclonal antibodies (mAbs) against ZIKV including four (ZV-48, ZV-54, ZV-64, and ZV-67) that were ZIKV specific and neutralized infection of African, Asian, and American strains to varying degrees. X-ray crystallographic and competition binding analyses of Fab fragments and scFvs defined three spatially distinct epitopes in DIII of the envelope protein corresponding to the lateral ridge (ZV-54 and ZV-67), C-C’ loop (ZV-48 and ZV-64), and ABDE sheet (ZV-2) regions. 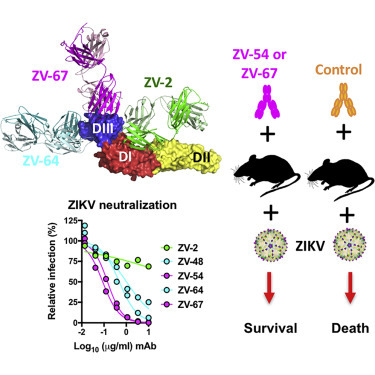 In vivo passive transfer studies revealed protective activity of DIII-lateral ridge specific neutralizing mAbs in a mouse model of ZIKV infection. Our results suggest that DIII is targeted by multiple type-specific antibodies with distinct neutralizing activity, which provides a path for developing prophylactic antibodies for use in pregnancy or designing epitope-specific vaccines against ZIKV.